Iwona Blazwick OBE, influential art critic and Director of London’s Whitechapel Gallery, has been awarded an honorary degree by Middlesex University. 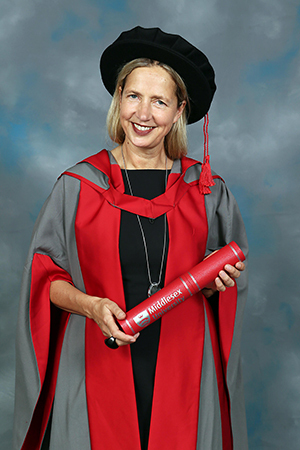 Iwona Blazwick OBE, influential art critic and Director of London's Whitechapel Gallery, has been awarded an honorary degree by Middlesex University. Formerly at Tate Modern and the Institute of Contemporary Arts, Ms Blazwick has also worked as a commissioning editor for Phaidon Press and as an independent curator in Europe and Japan. Ms Blazwick was awarded an OBE for services to art in 2007, and has served on numerous artistic juries. She is chair of the Max Mara Art Prize for Women, and serves on Film London's Jarman Award. She is a prolific broadcaster and lecturer, and also sits on the advisory boards of the Government Art Collection, the Fourth Plinth Commissioning Group and the Paul Mellon Foundation. Iwona Blazwick OBE said: "What an exciting and great honour it is to be recognised by an art school which has such a distinguished and revolutionary past. When it was formally known as Hornsey, it was legendary for pioneering new techniques in the education of artists, it changed the art world. So to be recognised by this great school is a great dream. It's fantastic!" Middlesex University Vice-Chancellor Professor Michael Driscoll: "Iwona Blazwick is a leading light of the UK's artistic scene, and works tirelessly to protect and promote contemporary art for everyone to enjoy. "We are very proud of the contribution Middlesex students and staff make to the creative industries, and we're delighted to be able to present Ms Blazwick with this award."